This is my third review in a series of recent reviews of IT Cosmetics products. I am a HUGE fan of their line. They have come a long way since the premier of their first products a few years ago. The line has expanded into a whole range of skincare and makeup products that are all multitasking products (anti-aging and skincare/makeup products at the same time). In fact, IT Cosmetics was the first line to incorporate this kind of technology and others followed suit. Today I want to discuss one of my favorite products which is a powder but acts like a foundation. Their Your Skin But Better CC+ Airbrush Perfecting Powder SPF50+ is a sheer to full coverage finishing veil and an anti-aging optical blurring perfector. I use it in two ways: as a finishing powder and as a light powder foundation. I love this powder and wear it not only as a finishing powder after foundation but also as foundation too! It makes a great lightweight foundation. For a skin-softening, flawless effect in just 30 seconds, gently buff on powder using your favorite IT Cosmetics brush. If using as a foundation, use the puff provided in the bottom or an optical-blurring foundation brush and apply powder, buffing in circles to face. Apply your multitasking CC+™ Cream SPF 50+ for highly pigmented full coverage, plus clinically shown skincare and sun protection. Add CC+ Airbrush Perfecting Powder™ SPF 50+ for an ultra-soft, flawless-looking finish! I love multitasking products like this because they give you more bang for your buck. Also, the sunscreen in this product is a mineral one, meaning that it comes from titanium dioxide 20% and zinc oxide 16%. These are not chemical sunscreens and therefore this can be worn by those who are allergic to chemical sunscreens. Mineral or physical sunscreens reflect the sun's rays off the skin instead of absorbing them into the skin as they do with a chemical sunscreen. 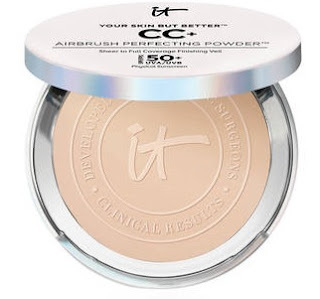 IT Cosmetics Your Skin But Better CC+ Airbrush Perfecting Powder SPF50+ retails for $35.00 and can be can be purchased online at www.itcosmetics.com, and at www.ulta.com, www.qvc.com, www.sephora.com and anywhere IT Cosmetics is sold. Like IT Cosmetics on Facebook:https://www.facebook.com/itcosmetics; Follow IT Cosmetics on Twitter:@itcosmetics; Follow IT Cosmetics on Snapchat:https://www.snapchat.com/add/it_cosmetics; Follow IT Cosmetics on Pinterest:http://www.pinterest.com/itcosmetics/; Follow IT Cosmetics on Instagram:https://www.instagram.com/itcosmetics/ and Subscribe to IT Cosmetics on YouTube: https://www.youtube.com/user/itcosmetics.